Ultimate Years was released in 2002 and is considered a “Best of” the first 30 years of J D’s career. The two CD set contains both ” The Ultimate Prophecy” and ” The Song of Crazy Horse” as well as 24 other cuts that were recorded between 1969 and 1999. 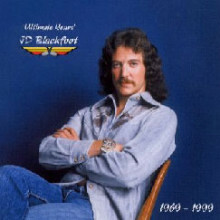 The photo for the cover of “Ultimate Years” is the same photo that was used for the cover of ” Southbound and Gone ” which is the only album to not yet make it to CD. The photo, taken by California photographer Leven Jester is, to this day, one of J.D.’s favorite photos of himself. J D was 31 when this photo was taken at Fantasy Studios in Berkeley, CA. in 1975.